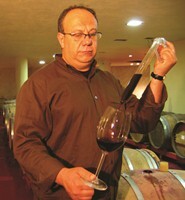 Yoram Shalom began acquiring his love for wine and winemaking as a child watching his father, Alexander Shalom, making wine at home. His interest and curiosity to learn and master winemaking developed through reading, experimenting, visiting and consulting vintners and winemakers in Israel and abroad. Finally, his urge and burning desire to make wine overcame him and he decided to switch to full time winemaking. He resigned his position as a photographer with the Israeli Television and became a full time winemaker and a winery owner. From a hesitant start, his dedication and drive for perfection brought his high quality wines to the public's notice, became highly acclaimed, sought after and known as top quality wines in Israel as well as abroad.